Up to this point we've been mostly focused on the donor. Now that it's dismantled we'd like to get started on the frame, but since the hulking donor chassis is still taking up half the garage, we're back to working on small metal bits. This has only served to remind us of our woefully inadequate fabrication techniques. The shock mounts are currently undergoing another redesign, and the steering rack and radiator mounts are just a dream, so to keep busy we've been making spacers for the spherical rod ends (a.k.a Heim joints), a task that would take the better part of an hour on a lathe, and the better part of a month the way we're doing it. 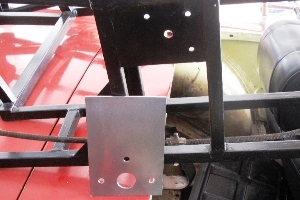 The differential brackets for the rod ends are 1-1/4" wide on the inside. The rod ends themselves are 5/8" wide. So it would figure that if we want to have a spacer on either side of the rod end, said spacers would need to be 5/16" thick, or .313" on the old dial caliper. That's not very thick, and of course that means we could do the same job with 4 or 5 washers. But how good would that look? We're not amateurs here. Okay, we are, but why advertise it? Almost as good as a lathe. Or maybe not. We're making spacers out of a 12" length of 1" round stock drilled with a 1/2" hole. 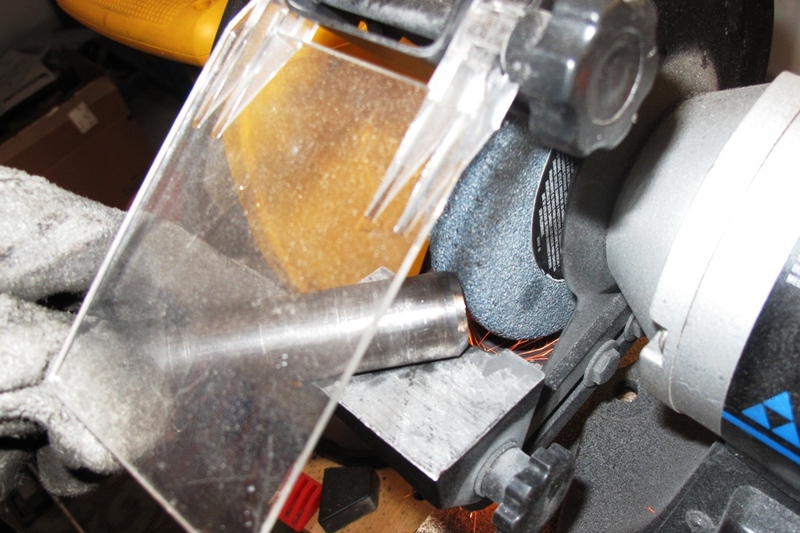 We start by chamfering about 1/8" off one edge of the tube at a 45 degree angle, using the grinder. We then chop a slice off the tube as close as we can get to .313". Oddly, this doesn't work as well as you might expect, and so we have to shave the hard-to-hold spacer on the sander until it's either .313" thick, or too hot to handle. After it's finally down to .313" and we're all done applying bandages, we can start the chamfer for the next spacer. Luckily, we only need to repeat this 14 times. When the spacers are done we plan to tack weld them in place on the differential brackets. That way they'll be permanently attached and therefore more difficult to lose when you're assembling or disassembling the suspension. This will be our first official welding on the Locost, so we'll have to do something special to mark the occasion, even though these aren't exactly structural welds and the spacers could probably be attached just as effectively with super glue. But how good would that look? Okay, I think we've already gone there. One task we got done quickly was the handbrake mount. Being a flat piece of 6" by 4" steel with four holes, it would've been difficult even for us to mess that one up. We let the chop saw do all the cutting, which is about 100 times faster than our usual Dremel method, but isn't as effective when you're trying to make something other than a straight cut in flat steel. 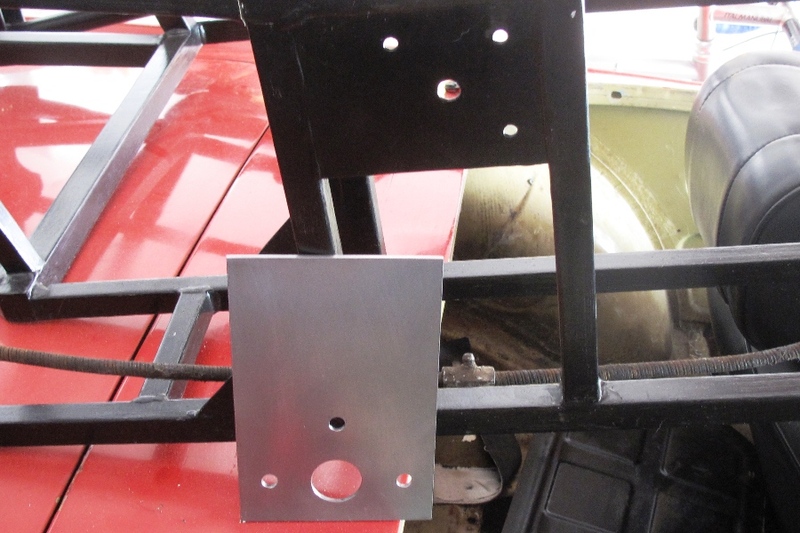 In addition to this welded-in mount, we're also going to need a 1/4" spacer plate to move the lever away from the transmission tunnel and out of the path of the driveshaft. I'm thinking aluminum. If the pedal box and steering column weren't enough to demonstrate the impracticality of building a car using parts out of an entirely different car, the e-brake was another reminder. Besides the spacing issues, the MGB handbrake lever was designed to snug up to a rounded and contoured MGB transmission tunnel. To do this, the lever is bent in several different directions, which isn't immediately obvious until you try to fit it alongside a perfectly straight transmission tunnel, as for example in a Locost. It works, but it looks like someone ran over it. I guess we'll paint it some dark color and hope no one notices.